I think the two biggest tips/lessons i learned were to research Wagons as fast as possible (they have massive range and can relocate units to the far side of your empire in one turn) and using them to medi-vac wounded units back to cities that can heal them much faster/cheaper (a city that can also produce that unit type provides that bonus). This ability to get new units to the front lines, as well as retreat/return damaged units quickly is incredibly powerful. Bummer. Poor Herminius and his doughty crew. As Rome it takes a long time to advance technologically to build Triremes. Once you do they take a while to build and train the crew properly. So it hurts to lose one in battle. And now this happened. Is this a random event or can the player mitigate chances of this? Does this event fire less often if sailing closer to shore? It occurred while sailing from southern France to Rome so they were crossing a lot of open water. You can turn these off when starting a game and uncheck “random events” in “Game settings”. Boats have higher chance of this happening (compared to galleys and triremes). Damaged ships have higher chance of this happening. For triremes and galleys this can happen only when they are on open sea (not on coastal tile), boats can be lost even on coastal tile (but the chance is low). If a ship has units inside, the chances are higher. Okay, that all makes sense, the logic hangs together so I will use more common sense. I live on the coast of Maine and know a thing or two about boats. So when I gave the Trireme directions to sail to Rome (it was slightly damaged) in the back of my mind I was thinking that I would never do that in real life. Good for you in modeling all of that. when I gave the Trireme directions to sail to Rome (it was slightly damaged) in the back of my mind I was thinking that I would never do that in real life. Note to self: do not hire @orald as a boat captain. I’m really good at dancing with governors’ daughters, though. Check some of the scenarios in Aggressors Steam workshop. I had this one on the ole wishlist, sort of waiting on a sale an circled back to see how discussion of the game was going only to discover no one talking about it?! Is everyone done with this one? What’s the verdict then? And is there any more content or updates coming out for it in the future? On the plus side, it’s neat that your units and cities require so much hand holding; they can be surprisingly delicate things that require upkeep and supply lines and loyalty and good terrain and time/resources to rest and heal after being in combat. Or to put it another way, when everything is aligned and your units are being used well they can be very effective and make rapid progress, but when mishandled it’s easy to get into a slow war of attrition that can last for decades, where you don’t have enough free resources to make changes/reinforcements, and you never have enough flex at the front to ever assemble a really effective force or change your disposition. I like that, it feels more like an Ancients world and less like a WWII world where it is more trivial to project and apply force. Example: You can have a unit of crack spearmen, but if they spend one turn badly out of supply, it will cause a large amount of morale damage and actual damage. From that point, it can require ~10 turns to bring them back to full fighting effectiveness. Alternatively, you might need them back on the line right frickin now. So they keep being pushed into engagements where they can’t fight at a good level of effectiveness, or they are placed into a defensive location to protect a city but where they can’t safely heal due to the threat of attack. And you don’t have a ton of units; that one spearmen unit might represent 10% of the total resources you can spare from your civilian economy. On the down side, once you get the hang of the thing every game is more or less the same. You know the basic idea of what you need to do, and then you need to spend hours carrying it out via the clunky UI and slow moving world. It’s a whole lot of mouse clicks per interesting moment at that point. The game is in my regular rotation, one of the ones I always find fun. But I still play almost exclusively on random maps, which I think really helps my view of its replayability. Thanks for the replies, I’ll keep an eye out for it on sale. Sounds like it’ll be worth a campaign for two to learn and once to excel. I’m game for that. We have received a number of very good reviews from various gaming websites in the past few weeks, and we would like to share at least some of them with you. Such reviews are evidence that the game has matured and been polished to a high level of satisfaction for you – our players. Still hesitating? Read some of the references and step in the world of Aggressors Ancient Rome with us! Aggressors: Ancient Rome is a great indie game in the 4X genre and it really deserves a go if you like turn-based strategy. Aggressors: Ancient Rome isn't just another Rome strategy game, this game is the only 4X Ancient Rome strategy game that deserves to use this setting. This is 4X gaming perfection. Everything is polished to a point, no mechanic is wasted, and everything comes together beautifully instead of being lost in needless complexity. 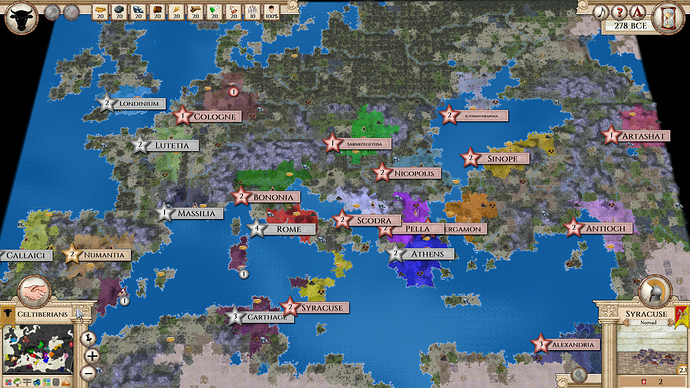 Aggressors: Ancient Rome does not try to evolve the 4x genre but will help you fall in love with it again. This game is deep and controlled and considered. Every element has been chosen for a reason and implemented with care. Tur tabanlı 4X strateji oyunu Aggressors: Ancient Rome'u sizler için inceledik. So, should my first game be with simple and advanced tutorial check boxes checked? Does the advanced one just continue where basic leaves off? Both tutorials are in-game. Once you finish it, you don’t have to start a new game, you simply continue playing. You can run them separately in different games or have them both turned on in the same game. In that case some of the tasks of the advanced tutorial are skipped and once you finish basic tutorial and you continue directly with the advanced one. In the basic tutorial you cannot “pause” it. It is guided and you follow instructions. Advanced tutorial can be paused or some tasks skipped altogether. Both tutorials can be cancelled anytime. I definitely recommend to turn on the basic tutorial for the first game. I would also suggest to have the advance tutorial turned on for the first game. If you want to play straight away (after you pass basic one), you either pause the advanced tutorial or cancel it (if you don’t want to follow it). Advanced tutorial is not guided and it just suggests possible (new) options. OK, thanks - I’ll keep them both on for this game. So my first game I started in the ancient world as Rome and I’m still plugging along - although it looks like Carthage may be getting too powerful to defeat. I just realized that with the custom world start, I could set development low and get a more traditional 4X start - no techs researched, a unit or two and one city. Anyone have experience playing this way? I typically like to start out small instead of inheriting a larger area like I did in my Rome start. 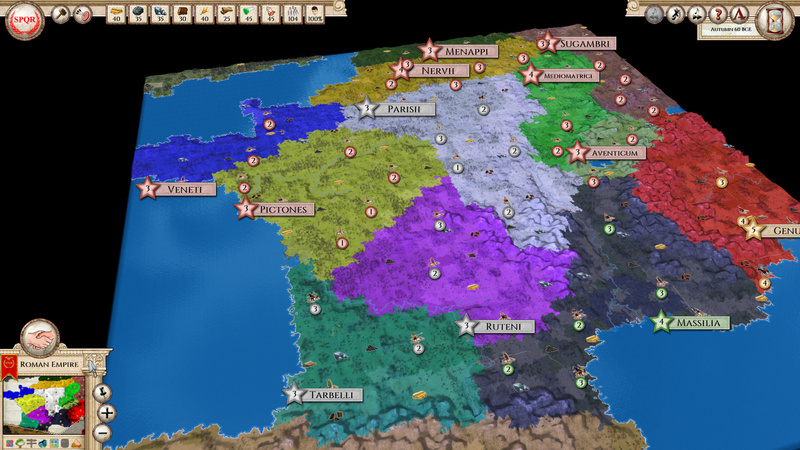 Any custom world settings that seems to work well for a more Civ-like experience? Yes, I almost always play on a Custom map. The default settings lead to a fairly traditional 4X start, but you can slow it down further by setting development to barbarian or even undeveloped. The options are accurately labeled on the setup page.